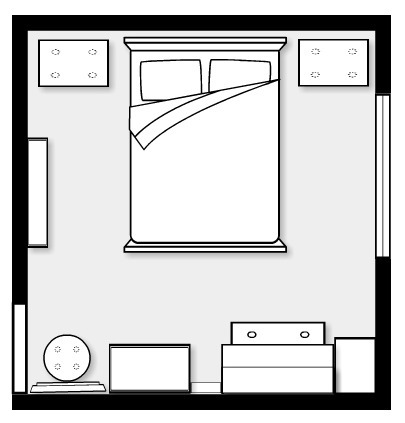 I recently completed a bedroom design plan for a young couple living in the city. As often is the case with condos, this space was tight and had bulkheads, columns and heating vents running all over. Storage was also a major concern. After meeting with Tanja and seeing the space, I could see why she was having difficulty putting a furniture and decorating plan together given all of the challenges. After seeing the bedroom design plan, Tanja is thrilled. Her first purchases have been the art canvases for above the nightstands, as well as the beautiful upholstered headboard. Our next order of business is confirming the wallpaper for the headboard wall, as well as freshening up the walls with a coat of Benjamin Moore’s Natural Cream. If you’d like to see other client projects, go here. Note: Client’s details (such as budget breakdown, profile, etc.) have been excluded for confidentiality reasons. 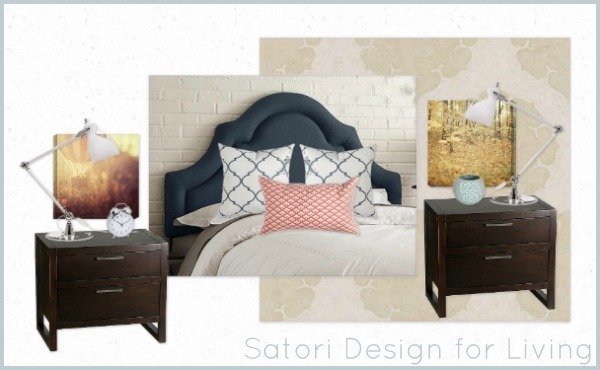 This plan is only a snapshot of one of our Satori Signature Room Designs and does not showcase all components in order to respect the fees associated with our services. Furnishings, accessories and other materials suggested at time of plan creation may no longer be available and are shown for stylistic reasons only. 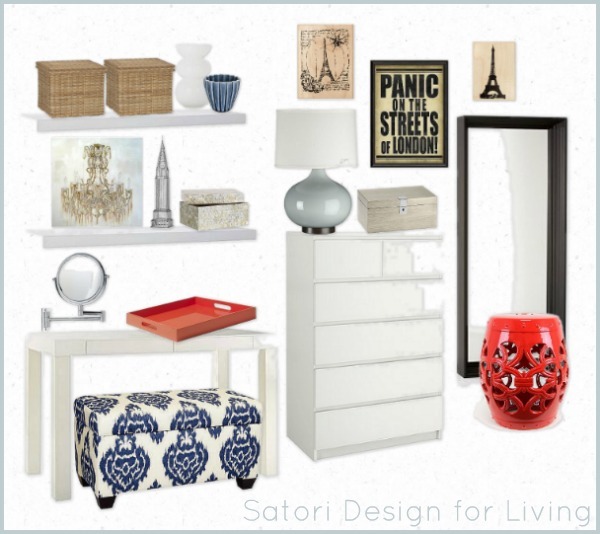 All designs and images are property of Satori Design for Living unless otherwise noted. I like the direction you’ve taken this space in – the pops of colour will really pop well, and the headboard is a great piece. Thank you for sharing! Thanks Sheila. I’m looking forward to seeing the whole room come together. So lovely! I really like the side tables and the ottoman provides that pop of colour and pattern that will make the room. Nice job. Thank you Kelly! I’ve had my eye on those bedside tables for a while and I was glad to finally use them for a project. They have that zen vibe that my client was looking for. On I am loving this bedroom! It is a small place, but you have maximized the storage and style! So pretty! I love, love the headboard! I love the way you combined the navy and coral an white. I have been looking for a navy headboard myself, so thanks for the information!